The results are in! Our team members have wrapped up our annual Caring for Kids campaign, with results that are nothing short of amazing. This total is the highest in the history of Caring for Kids, and given the fact that this campaign has now been going strong for 34 years, that’s saying a lot! Of course, Caring for Kids wouldn’t be nearly so successful without the generous contributions of our partners. The Neighborhood Ford Store once again donated a car – a 2013 Ford Escape – to be raffled off to one lucky winner. Brendan Dawson of Cheswick, PA got a special holiday surprise on Wednesday when his ticket was drawn by a patient at the Children’s Hospital of Pittsburgh of UPMC. Congratulations, Brendan! Congratulations 2013 Ford Escape Winner! Congratulations to the winner of our 2012 Caring for Kids vehicle raffle! 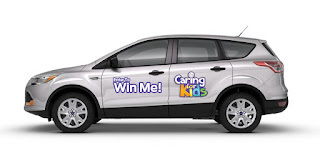 The lucky winner of the 2013 Ford Escape- so generously donated by the Neighborhood Ford Store- is Brendan Dawson of Cheswick, PA.
Brendan's winning ticket (number 030773) was randomly selected from more than 77,000 tickets purchased to benefit Eat'n Park's Caring for Kids Campaign. Mr. Dawson will be receiving the keys to his new vehicle in the upcoming weeks. The holidays are here and if you are like me, you are trying to find the perfect gift for everyone on your list. You’ve got the mailman, the babysitter, the teacher, and many more. So what do you get those people? Eat’n Park gift cards! And for a limited time, you’ll get a FREE $5 bonus card with every $25 in Eat’n Park gift card purchases at our restaurants. It’s like a reward for being such a great gift-giver! Bonus cards are valid from January 1 through March 31, 2013. So you have a full three months to use them! You’ll get one $5 bonus card for every $25 in gift card purchases, regardless of the denomination. So, if you buy five $5 cards, you’ll get one bonus card. Buy $100 worth of gift cards, and you’ll get four $5 bonus cards. You get the picture. But here’s the catch: We only have a limited supply of bonus cards, and we can’t make substitutions. So when they’re gone, they’re gone! Stop in to your local Eat’n Park today to get yours, then relax – holiday gift-giving doesn’t get any easier than this! * Bonus cards are only available at Eat’n Park restaurant locations. This offer is not available with online gift card orders. Bonus cards may be redeemed one per check from January 1 – March 31, 2013. Multiple bonus cards cannot be redeemed on the same check. Our classic commercial is celebrating 30 years on the air! It has been warming the hearts of young and old since 1982, and we're proud to continue to air it year after year. In celebration of its 30th anniversary, we have a lot of special things happening. Read on to get the scoop! Have friends and family who have a special place in their hearts for the commercial? Send them your holiday greetings with a customized Christmas Star e-card! Loved ones will be able to view the commercial, as well as your own personalized message, right on their computer or phone. Click here to try it now at http://www.sendthestar.com/! Stop in to your local Eat'n Park to pick up limited-edition Christmas Star travel mugs, ceramic mugs, magnets, and Christmas ornaments. Better hurry though - these items are going quickly! At the following locations, you'll also find Christmas Star long-sleeved t-shirts. These locations will be receiving additional stock by the end of next week, so if the restaurant nearest you is sold out at the moment, check back later! 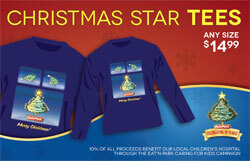 10% of all Christmas Star merchandise sales will benefit our 34th annual Caring for Kids Campaign. Exclusively in our online store at Smileycookie.com, these special-edition cookies come in two versions, both featuring different images from the commercial, and rimmed with sparkling sugar crystals. Made from the same recipe as our Original Smiley Cookies, these Christmas Star versions are sure to inspire oohs and aahs with friends and family near and far. And, $2 from every dozen sold will be donated to our Caring for Kids campaign. Buy 2 dozen, and we'll donate $5! These cookies are nut-free. Think watching the commercial online just isn't the same as seeing it on TV? For you purists, here's the listing of when and where the commercial will be airing. Check your local listings for times. Ever wondered just how this classic came to be? Wonder no more - just click here to read the story (and all the wonderful comments left by our readers!). In the spirit of the Christmas Star, throughout the month in the Pittsburgh area, our helpers will be performing random acts of kindness. Of course, it would spoil the fun if we told you when and where these were happening! However, if you've been a recipient of one of these acts, please visit our Facebook page to tell us how you paid it forward! In honor of the commercial's 30th anniversary, our friends at Lightwave International orchestrated a laser rendition of the commercial, which was shown at the Santa Spectacular during Pittsburgh's Light Up Night. In case you missed it, one of our fans sent us the video below. Check it out! Last, but most certainly not least, you can view the commercial right here, right now. May the special lift you get this holiday season last all year long! Our Caring for Kids Campaign kicked off a few weeks ago! Take a look below to see if your local Eat'n Park has a special event coming up! Pre-Thanksgiving and Black Friday Deals at Eat'n Park! At ths time of year, who doesn't love a good deal? And lucky for you, we've got TWO of them! On Wednesday, you'll be busy prepping for your Thanksgiving feast, so let us help with dinner. Use the coupon below for $2 off a quart of soup. Grab a quart or two on the way home (it IS Potato Soup day, after all), and dinner's already taken care of. After Thanksgiving, don't hit Black Friday's sales on an empty stomach. Stop in to your local Eat'n Park to fuel up with our Shopper's Breakfast and Fruit Buffet. At only $6.99, it's a bargain! And it just wouldn't be Black Friday if we didn't sweeten the deal even more....so, here's a coupon for a free latte! Valid on Wednesday, November 21, 2012 only. Valid on Friday, November 23, 2012 only. Find your local Eat'n Park below to see if/when the Shopper's Buffet will be available. This holiday season, there's an easy way to cut out a big chunk of stress - let us do all of your baking! We'll handle the muss and the fuss, while you relax and enjoy your found time. 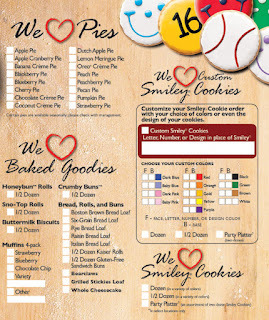 We have the favorites you're familiar with: Smiley Cookies both regular and mini, and a wide variety of pies (fruit and creme pies - whatever suits your fancy). It’s hard to believe that this year marks the 30th anniversary of our beloved Christmas Star commercial. We have a lot of fun things planned as part of our celebration, but more on that later! Right now, we’d like to introduce you to our new Christmas Shoppe! Our Christmas Shoppe will be selling limited edition Christmas Star merchandise from now until the end of the year. Best of all, 10% of all merchandise sales will benefit our 34th Annual Caring for Kids campaign. These are sure to sell out fast, so stop in soon! 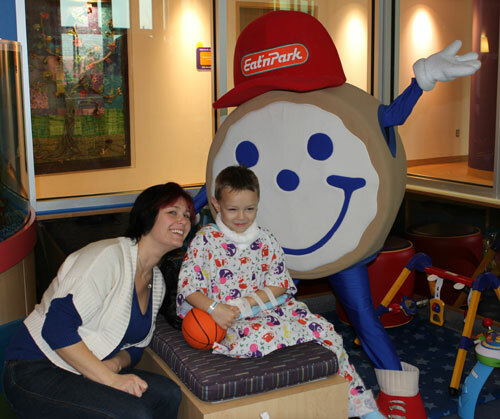 Since 1979, Eat'n Park guests and team members have united to do some serious fundraising for five weeks every November and December. That's right - it's time for Caring for Kids! Through this campaign, we’ve raised more than $8 million for our local children’s hospitals, but we’re not stopping now! Our 34th annual Caring For Kids Campaign kicked off on Friday and we’ve got lots of fun opportunities for you to help support the kids this year! Our generous partner, The Neighborhood Ford Store, has kindly donated a 2013 Ford Escape to the campaign - so one lucky guest is going to be taking home a pretty nice Christmas present! You could win this new 2013 Ford Escape! This holiday season marks an important milestone at Eat’n Park: the 30th anniversary of the Christmas Star commercial! This beloved commercial captures the true spirit of the season, as well as the spirit of Caring for Kids: helping others in their time of need. To help us raise money for our Caring for Kids campaign, 10% of proceeds from all Christmas Star merchandise will go to Caring for Kids. You'll find mugs, magnets and ornaments at every Eat'n Park location. In addition, restaurants that normally carry apparel will be featuring Christmas Star long sleeve t-shirts! We'll be updating the schedule of events every week, so check back often to see what's happening at your local Eat'n Park! Click here to see our most updated schedule. 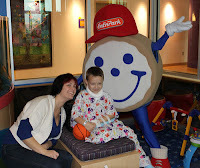 Our Caring for Kids Campaign kicked off last week! Take a look below to see if your local Eat'n Park has a special event coming up! 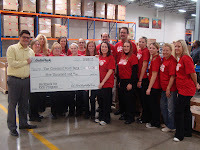 As part of our LifeSmilesTM initiative, we recently donated $5,000 to the Greater Cleveland Food Bank for their BackPack for Kids Program. At the beginning of every school year, the program provides a new backpack and a can opener to children at risk for hunger. Then, once a week throughout the year, the kids’ backpacks are refilled with enough nutritious food for six full meals. They receive items like applesauce, soup, vegetables, cereal, and many other items to help them get through the weekend. In addition to our donation, we also took some of our team members to volunteer and stuff backpacks. It was a really neat experience, and we stuffed over 600 backpacks! To learn more about the BackPack for Kids Program, click here. Halloween Spooktacular at Eat'n Park! Who wants tricks when you can have treats? At Eat'n Park, we've got plenty of treats to satisfy the ghouls and goblins in your haunted mansion. Halloween Smiley Cookies are on sale right now in our restaurants for just $6.99 per dozen. With candy corn eyes and a crooked smile, they're hauntingly delicious! We're also offering our Mini Smiley Cookies in Halloween colors for just $5.99 per dozen. And if you want to get in the spirit of the season without a full-out costume, our glow-in-the-dark Halloween Smiley T-Shirts are the answer! Find them at select locations - just click here for our listing. Finally, don't forget that SmileyCookie.com has everything you need to prepare for a Halloween shindig, as well as wrapped treats for your neighborhood trick-or-treaters, and specialty Halloween gifts to send to friends and family. Click here to check out our selection. P.S. Grab a dozen Halloween Smiley Cookies while you're in - they're on sale this month for just $6.99 a dozen! As many of you know, a few months ago we held a coloring contest as part of Smiley’s birthday celebration. We received thousands of entries and chose winners from each of our restaurants. The restaurant winners received a backyard activity kit filled with a basketball, soccer ball, jump rope and other fun activities. Then, of those 71 winners, we selected one grand prize winner! Drum roll please…the grand prize winner of this year’s stay active coloring contest was Searrah B. from Shaler! A few weeks ago we got to present Searrah with her grand prize: four bikes for her entire family from Big Bang Bikes in West Mifflin. What a great day! 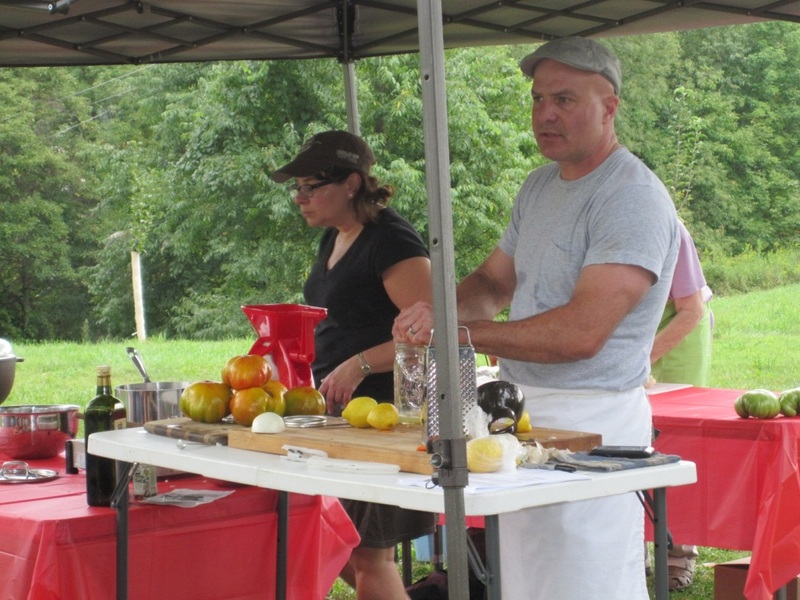 The class was at a farm called Blackberry Meadows in Natrona Heights. 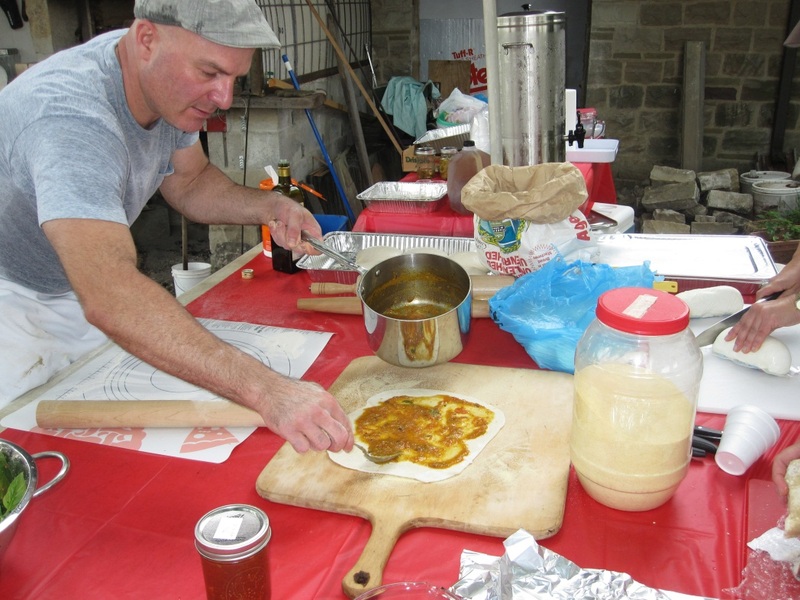 The farmers, Greg and Jen Boulos, set up a large tent to in front of their home that housed 50 Slow Food members who were eager to learn the art of canning. 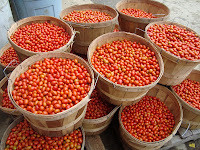 I taught the basics of the canning process, from sterilizing the jars to filling them with tomatoes, then to pressure-canning them for preservation. I also made a quick tomato sauce using yellow tomatoes. 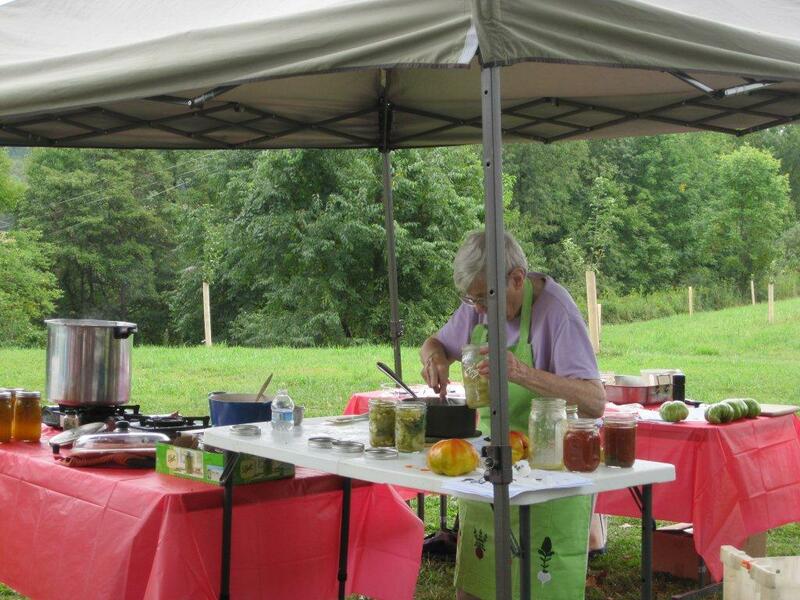 ﻿﻿﻿﻿The day couldn’t have been complete without my friend Nancy Hanst, who did a demonstration on how to pickle green tomatoes. Yes, I said pickled green tomatoes; don’t knock them until you've tried them! They were really quite interesting and very tasty. I’ve got a few green tomatoes left in my garden, so I just might make them. 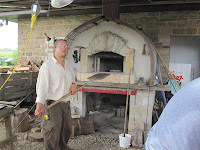 ﻿One of the highlights of the day was an outdoor wood-fired pizza oven. Canning takes a lot of energy, so pizza was the perfect food to make. 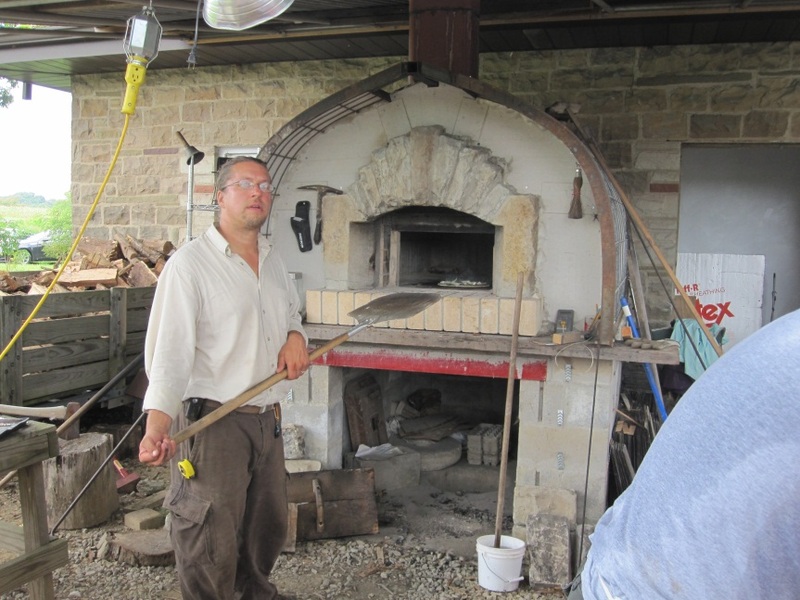 The oven was 900 degrees, and it baked the pizzas in less than 90 seconds! ﻿During Nancy and Virginia’s presentation, I rolled out dough and a few other volunteers (Betsy, Alyce, Amy R. and Amy B.) helped top the pizzas with our homemade sauces, fresh mozzarella and some of Jen’s basil. They turned out awesome. After the pizzas, we served ice cream that we topped with Virginia’s tomato dessert sauce. The ice cream really enhanced the flavors of the tomatoes. It was a great way to finish a long afternoon. P.S. 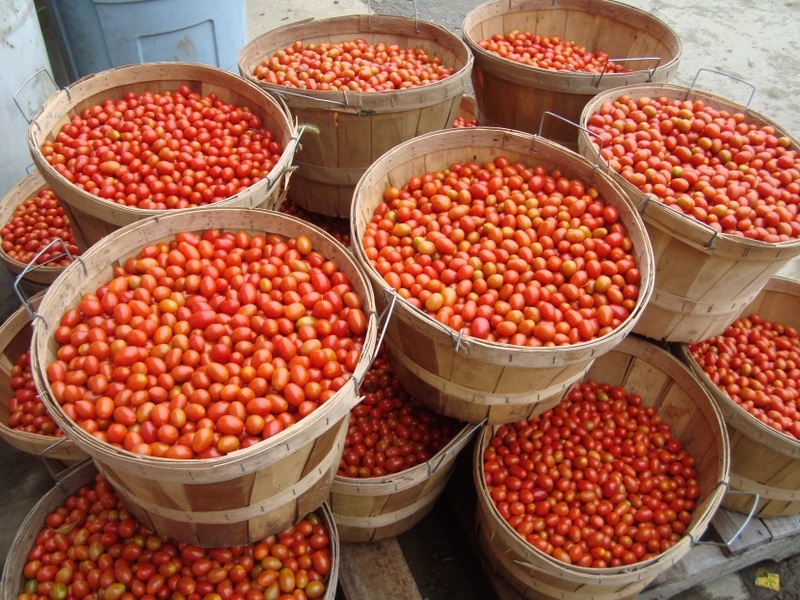 Click here to view last year's blog post and video on how to can tomatoes. Get a coupon for a FREE slice of Pumpkin Creme Pie at Eat'n Park! Yep, you read that right - try our delicious new Pumpkin Creme Pie for free! All of our email club subscribers will receive a coupon for a slice of this delightful new pie on October 8. To get your coupon, all you have to do is become a member of this elite group! How do you do that? Easy. Just click here to sign up by October 6. You'll find your coupon in your inbox on October 8. We told you it was easy! Of course, a little slice of heaven isn't the only thing you'll get from our email club. We give our subscribers more than $40 worth of coupons and freebies every year! You'll get a coupon just for joining, special offers for your birthday and wedding anniversary, and lots of other discounts throughout the year. Plus, you'll be the first to know about our menu specials, and you'll have opportunities to share your opinion with us through surveys and focus groups. How cool is that?! 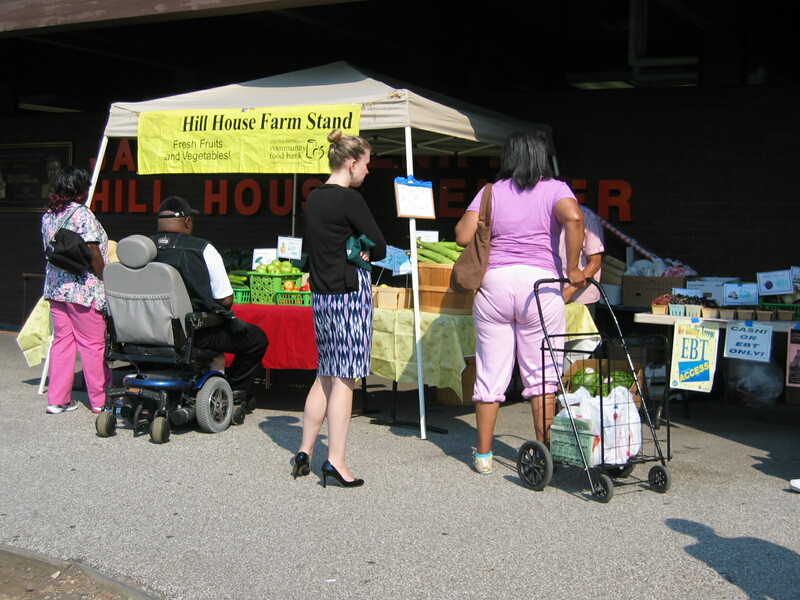 ﻿﻿﻿﻿﻿﻿One of the coolest things about summer is having the opportunity to eat a variety of local vegetables. 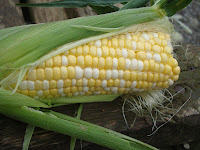 Who doesn’t love corn on the cob in the dog days of summer? Well, our visit with the Yarnick’s on September 5th started off with eating freshly picked raw corn. Yep, you read that right, raw corn. When you have fresh, juicy corn from the field, it’s doesn’t need to be boiled – trust me! 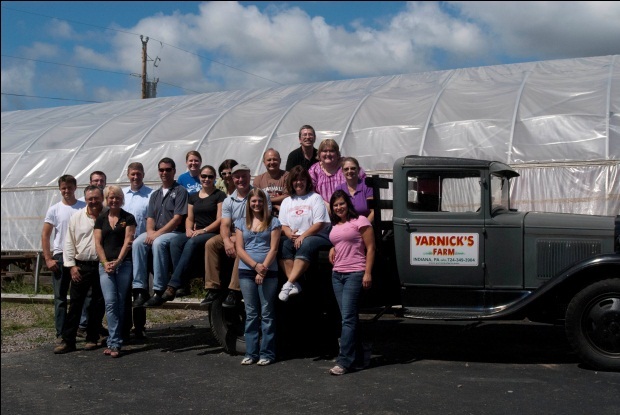 Dan Yarnick is the owner of Yarnick’s farm in Indiana, PA. Our team members thoroughly enjoyed meeting Dan and his family. We really gained an understanding of how passionate Dan and our other partner farmers are about growing the best, freshest produce for us to feature in our restaurants. 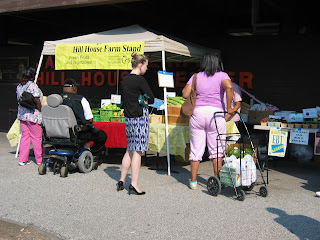 ﻿﻿After we tasted sweet corn, we visited the greenhouses to see what was being grown. The heirloom tomato house was my favorite. 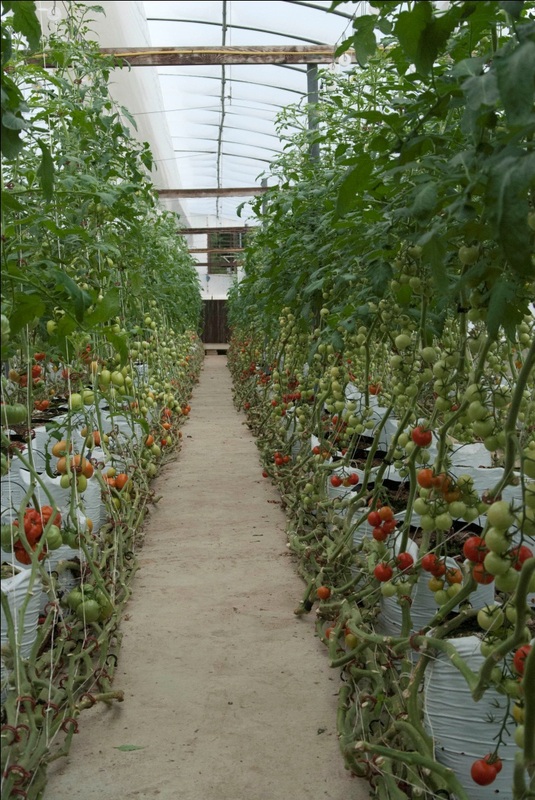 It’s amazing that these tomatoes were planted in February and will continue to produce fruit until October. Many of us at Eat’n Park are a little competitive, so to put competition into the mix, we decided to do a yellow squash picking competition. The first person to fill a ½ bushel basket wins a basket of everything that the Yarnick’s grow. We all loaded up on the back of a wagon that was pulled by one of their tractors. 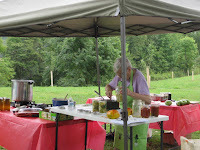 The competition was fierce, since we had some seasoned veggie pickers. 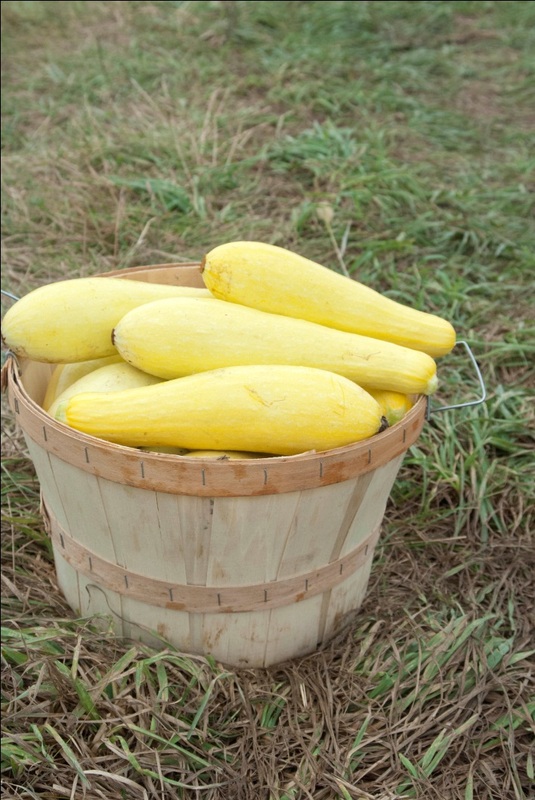 Two of our team members grew up on a farm, so picking squash was old hat to them. Of course, one of them was eventually crowned the winner. 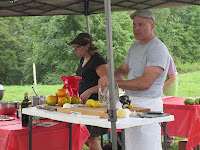 I hope that you enjoy reading about our farm tours. I look forward to telling you more about the food we source and the steps we’re taking in being a sustainable restaurant.